Use the new Timeline Storyteller custom visual in a report, and win a Power BI Super Swag Prize Pack! See details. Timeline Storyteller, a new custom visual for Power BI I created with a team of other researchers at Microsoft, is now available in the Office Store for anyone to use. Alberto Cairo, Knight Chair at the University of Miami and renowned data visualization professor, author, designer and practitioner, shared his thoughts on the new visual after seeing it presented at a recent Microsoft event. “When humans began transforming information and pictures to enhance understanding, two of the first things they visualized were space and time. Timeline Storyteller is the latest landmark in a tradition that spans centuries, and what a great accomplishment it is,” says Cairo. The work on this visual began in 2015 when we drew on our expertise in information visualization and data-driven storytelling and set out to explore ways to help people tell expressive data stories with timelines while maintaining perceptual and narrative effectiveness. People have been using timelines for centuries to visually communicate stories about sequences of events, from historical and biographical data, to project plans and medical records. From hand-drawn illustrations to contemporary infographics, storytellers have employed a wide range of visual forms for communicating with timelines. 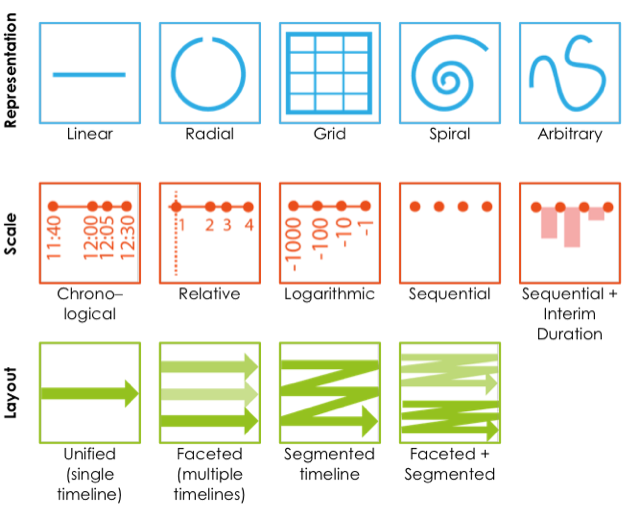 Depending on how a timeline is drawn, different types of insights and temporal characteristics can be emphasized, including periodicity and synchronicity. In recent years, there has been an emergence of interactive timeline visualization tools used for data-rich presentations and storytelling, especially within the data journalism community. Yet, most of these presentation tools adopt the linear, chronological timeline design popularized by Joseph Priestley in the late 18th century, and thus lack the expressivity to communicate a range of timeline narratives or allow viewers to visualize timeline data themselves in new and interesting ways. We conducted a survey of hundreds of timelines published over the course of history from a broad range of sources including timeline visualization tools and visualization techniques proposed in academic research literature, as well as bespoke dataset-specific interactive timelines and timeline infographics. We identified 14 design choices characterized by three dimensions: representation, scale, and layout. Representation, which refers to the overall shape of the path across the display, is the most visually salient aspect of a timeline. Scale is used to convey relations between events (e.g. order, duration, & synchronicity), and refers to the correspondence between temporal distances and distances on the display. Layout is used to communicate relations between groups of events, and describes how the timeline is partitioned into separate regions of the display. Given these dimensions, we also identified viable combinations of representation, scale, and layout that correspond to different narrative purposes. This design space for timelines became the basis for the initial design of Timeline Storyteller. 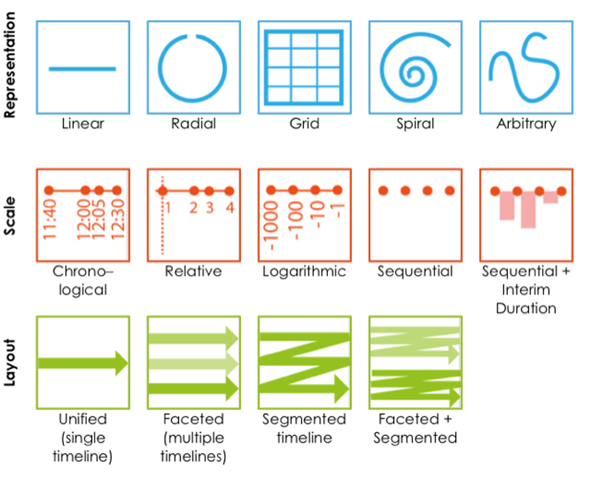 The 14 design choices characterized by three dimensions (representation, scale, and layout) for expressive storytelling with timelines. “Timeline Storyteller is a flexible tool that enables designers, journalists, and scientists to visualize time in multiple ways, some clear and straightforward —my preferred ones— others quirky and expressive. It's a very flexible and easy to use tool that fills an underserved niche,” says Cairo. The data storytelling tool was developed to realize the expressive potential of the timeline design space, combining a wide range of visual design ideas with modern techniques for presenting, annotating, and interacting with data. To create a data story with Timeline Storyteller, an author creates a series of scenes, where each scene has a unique filter state, design specification, and a set of associated annotations, images, and captions. Additionally, Timeline Storyteller uses animated transitions between the scenes of a story to promote a cohesive and engaging storytelling experience. Timeline Storyteller was initially released as a standalone web application in January 2017. Within the next few months, I demonstrated Timeline Storyteller at the Tapestry data storytelling Conference and at OpenVisConf, a practitioner conference centered on visualizing data on the web. Meanwhile at Microsoft, we partnered with the Power BI product team as well as Principal Researcher Chris White and his team to bring Timeline Storyteller to Power BI as a custom visual. Following in the footsteps of SandDance, a custom visual for Power BI that originated as a Microsoft Research project, we worked to make the custom visual available to Power BI users for free in the Office Store. Both Timeline Storyteller and SandDance are examples of the growing library of custom visuals that provide experiences beyond Power BI’s out-of-the-box visualization types and set Power BI apart as a robust tool for data storytelling. Throughout the development process of the Timeline Storyteller custom visual, we were motivated and informed by clients’ timeline stories. Using the initial prototype version of Timeline Storyteller, we worked with the UK National Trust to produce a timeline story about some of the most famous historic sites in their portfolio. During James Phillips’ keynote at the 2017 Data Insights Summit, the National Trust’s Jon Townsend presented this story, providing an audience of thousands with a first glimpse of the storytelling capabilities of the new custom visual. We have continued to showcase Timeline Storyteller in stories ranging from the history of the U.S. Open golf tournament to the progress of Artificial Intelligence at a variety of industry events. See how 2016 U.S Open champion Dustin Johnson stacks up against previous tournament winners. We are seeing a lot of excitement and interest in the Timeline Storyteller custom visual for Power BI. For the first time, a single visual can help people tell stories about the history of epidemics spanning centuries, the development of severe hurricanes over the past several decades, or even the daily routines of famous creative people. Timeline Storyteller is of particular interest to data journalists, and has been featured on several industry sites including Storybench and Visualizing Data. We understand that interactive, data-rich stories are in high demand, and that journalists need to be able to easily create unique data stories that not only inform and educate, but also engage and entertain. Power BI is a powerful data storytelling tool, and with Timeline Storyteller, journalists can now visualize a sequence of events in a compelling way using the large palette of design options that Timeline Storyteller provides. Plus, with Power BI publish to web functionality, journalists can easily publish their interactive timeline stories to their website, reaching an unlimited number of readers with the scale of the Microsoft cloud. “Tools like Timeline Storyteller serve another purpose: they bridge the gap between code and presentation. Many graphic designers and journalists aren't able to code visualizations from scratch. Timeline Storyteller, and other tools like it, abstract creation process through a graphical user interface and, at the same time, allow people to customize the results in an almost unlimited manner,” says Cairo. We encourage you to keep learning more about how Power BI can be used to tell your data stories. To learn more about how we have been working with journalists and media organizations, visit the Power BI data journalism website or email the Microsoft Data Journalism Program with questions. To get started with building your own story with the Timeline Storyteller visual, take a look at the following video and download Timeline Storyteller in the Office Store today. To learn more about the research behind Timeline Storyteller, see https://timelinesrevisited.github.io. To contribute to the open source project, visit https://github.com/Microsoft/timelinestoryteller.